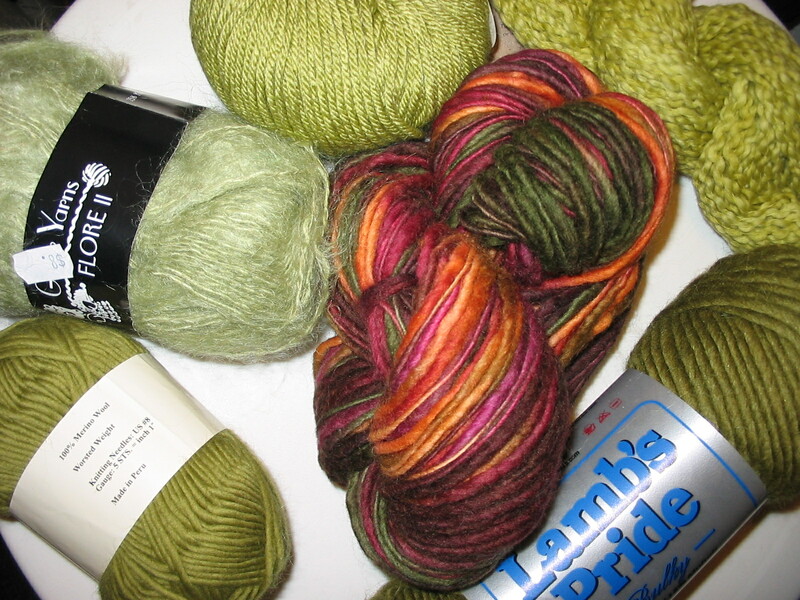 I’ve been playing with Yahoo Pipes and I made an RSS feed of other knitting blogs and linked to it from the sidebar. Fellow knitting circle members: if you have any blogs with RSS that you’d like me to add, or any design-y things you want me to change, just let me know. I hope to make one that has a Yahoo map of all the NYC knitting stores. Spin Out 2007 Is Coming!! So I still don’t know how to spin, but darn it, I’m setting a deadline so that I can participate in this year’s spin out in Central Park. Ladies if you are up for it, it is on September 29th. I’m sure you can go even if you don’t know how, there will be great fiber mojo! A sewing needle went missing Sunday night during knitting circle and Mister Miel, the yarn ingesting cat, had a guilty look on his face. The circle made a mad dash to the Animal Medical Center on 62nd and York, and, after an overnight stay, we got one very sleepy cat back. A few days later, they mailed us the x-rays and the really gnarly needle and thread. That’s right people. I HAVE A PROJECT. Not to go overboard on the puns, but it is the MOTHER of all projects. My mom asked me to make her a “summery” throw, as the one I made a few years ago is lovely but rather dark. It is made up of various shades of dark red. 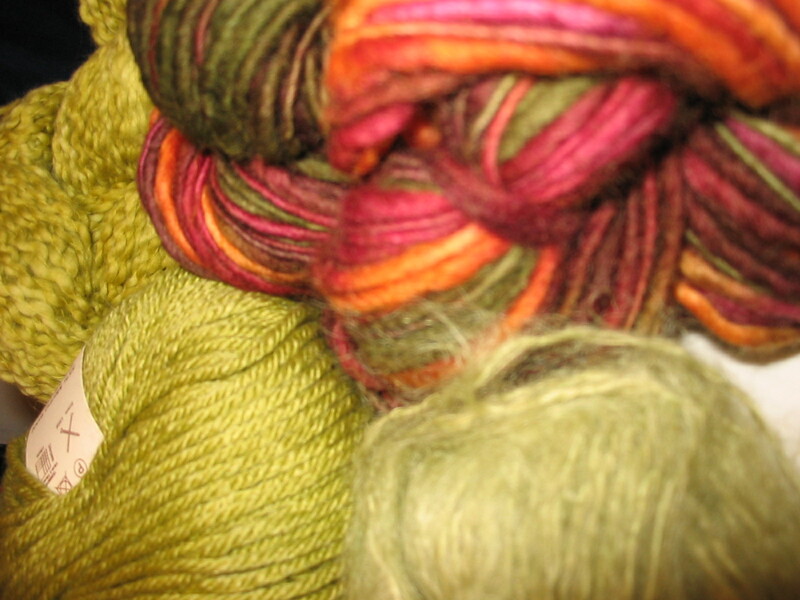 This one will be lighter sage-y colors plus some variegated Manos for that “pop.” It should be good. Check back here again soon for a progress report. I don’t think it will be done by mother’s day (the last one took me the entire length of Twin Peaks to finish, however many hours that is) but it’s the thought that counts. Sorry, click for larger pics. I’m having issues posting today. After some major frogging and some more minor frogging episodes I am 2 repeats and a border away from finished! 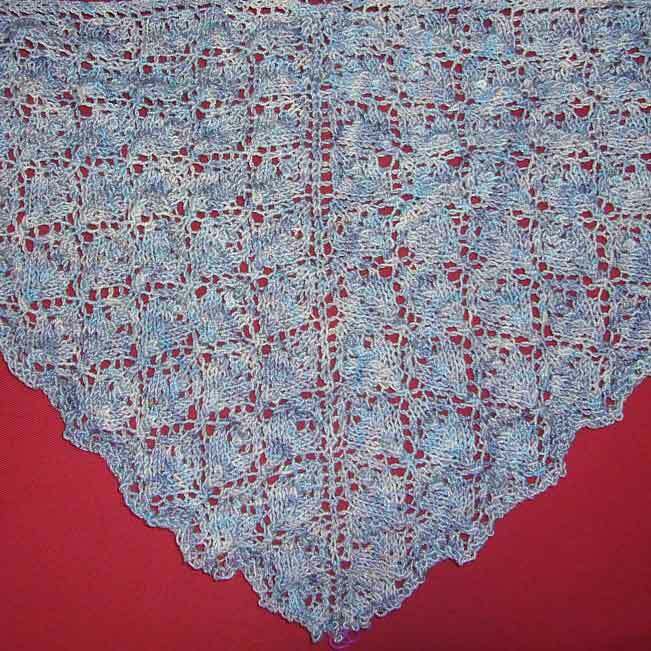 This is a pretty simple lace pattern. I’d definitely recommend it for first time lace makers, but have some coffee before delving in. I’m now blaming caffeine deprivation for my shawl folly.